It’s a sort of castle condo in the San Francisco sky. Measuring in at 3,750 square feet and covering two floors this condo is not only sky bound, but pretty much stratospheric in terms of rent. Try $20,000 per month. Shell that out and you have a luxury condo with uber amenities and features perched with a gorgeous high floor view in the Cow Hollow and Pacific Heights neighborhoods at 2134 Green Street. The views include uninterrupted panoramas of the Golden Gate Bridge and sweeping east across the San Francisco Bay—all through floor-to-ceiling windows that are clear as gin. The unit includes six bedrooms and four-and-a-half bathrooms, a cavernous living room, foodie kitchen, a variety of study or leisure rooms, custom designed and built furniture, and two laundry rooms. The apartment was completely redone in 2010, and is meant for families coming to SF for the first time from out of state or country. This condo is not the most expensive. 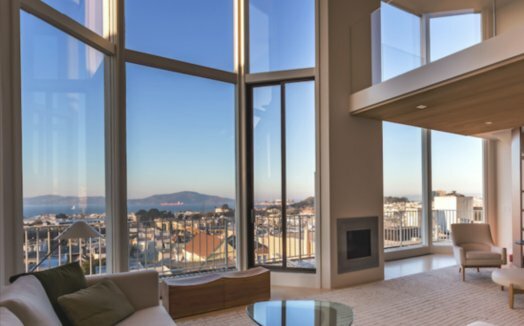 It is the 6th most expensive, with the top price unit coming in at $28,000 per month at 765 Market Street.